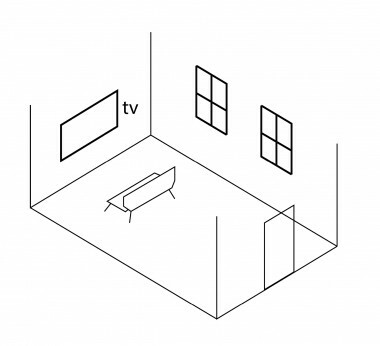 Where to put a television in a room? Placing your TV in the right place to make the experience the best possible is not as simple and intuitive as many people would think. Read on to find out the best ways to position your television in any room of your house. When decorating the room, most people first place the sofas. Often they put them against a window, for the entry of light heats up the seats and makes this area become a space for sunbathing while reading. In consequence, people tend to put the TV on the wall or cabinet that is in front of the sofa. Under this scheme, the image suffers because it receives sunlight, getting degraded. This is the example image below. This disposition contaminates the screen with too much glares. Having a direct light source toward the screen will create uncomfortable glare. The windows will reflect white squares on the screen, which ‘wash’ the color and generate points that distract the viewer. This might also happen with the different lights inside the house. The first thing to consider when you are about to place your TV is to avoid putting it in front of any source of light. When we buy a house or an apartment we like to have a space that will get both the morning and evening light. When we don’t put the TV in front of the window wall, we usually put it perpendicular to this, letting the light in to heat the space and somehow allowing to see the screen. As in the following image. This disposition continues to generate light pollution, but no longer produces uncomfortable glares on the image. The position of the sun (or better yet, the orientation of the room) influences the image we see. If the sun sets behind the line of the TV, the evening light will hit directly the spectator in the face and disturb their vision. If light enters laterally it might “wash” a little the image by the reflection of the window on the screen. The ideal in this situation is to put the TV as far away from the window. The light coming through the window will be more even and, as the sun doesn’t come from the front, it should not hit the spectator’s face. Obviously this is an ideal situation and many rooms have to accommodate the built environment. In case you have translucent curtains, closing them will help disperse the light pollution and lower the brightness. The best location for your TV is a room with no light pollution. If it is a room with large windows, try putting ‘black outs’ or thick curtains to completely eliminate light penetration. 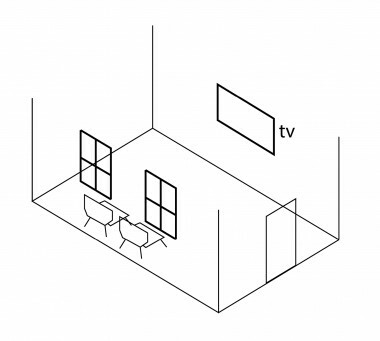 The lamps must be on the same side of the TV to bounce light into space without creating glare on the screen. Preferably the lamps should direct the light toward the ceiling, as an inverted cone. Few light sources generate a more accurate image. The image above shows a very clean space. If what matters is to focus on the TV, you must have the indispensable furniture, without much decoration and the righteous additional equipment to enjoy your entertainment system. 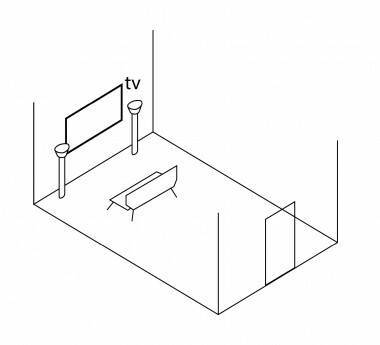 Like the works of art in a gallery, the ideal height of a TV must be between 4.60 and 5.20 feet. If the TV is higher than that, a distortion in the perspective appears and its height begins to affect the colors of the screen. The ideal height is a point that allows an optimal line of vision whether standing, lying or sitting.